Get ready to vote for #4 Homemade Peach Ice Cream or #13 Coca-Cola Cake! It’s the Cakes, Puddings and Ice Cream division of the Southern Sweets Showdown. A few years ago, my sister gave our daddy a Christmas present that would change our lives forever: The Ben & Jerry’s Ice Cream Recipe Book. OMG. If you haven’t added this to your cookbook collection, go get it right now. We’ll wait… Back yet? It’s amazing, amirite? Hoo-boy! 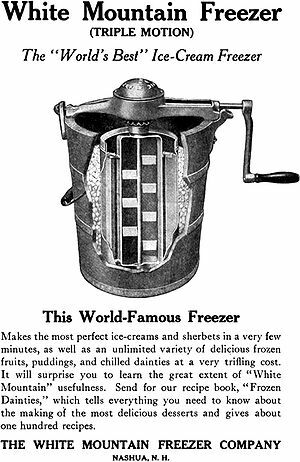 I had always politely turned down the melty, slightly sloppy homemade ice cream of years past. (What? If they were cranking up the ice cream freezer, there had to be a cake SOMEWHERE on the premises.) But apparently, B&J don’t just give you the recipes; they give you all sorts of tips, too, like “packing”, which apparently solves the melty-sloppy problem. Anyway, this isn’t a paid advertisement for Ben & Jerry’s (please send samples and vouchers to Deborah c/o RSM), it’s an ode to creamy, cold, lick-it-straight-off-the-paddle homemade ice cream, loaded with the best of the ripest Chilton County peaches at the roadside stand that day, #4 Homemade Peach Ice Cream. And if you have some pecans lying around, don’t mind if I do. The other contender in this round is a testament to the creativity of Southern ladies during World War II. Even though sugar was rationed, no table would be complete without a cake. So what to do, what to do… Make do with what you have! And in the South, you ALWAYS have Coke. #13 Coca-Cola Cake is exactly what it sounds like… a cake made with Coke, frosted with icing made with Coke. And if that doesn’t pretty much define Southern goodness for you, well, I got no help for you. In a region where people ask if you want a Coke, then ask you what kind, a chocolate Coca-Cola Cake is the perfect combination of sweet baked goodness and tradition. Something about the effervescent Coke makes the cake itself fluffy and tender, and when layered with chocolatey Coke-flavored frosting, there’s nothing better. Given an uninterrupted hour and a fork, I can eat the whole blasted thing do some serious damage to a double-layer chocolate Coke cake. Hey, I told you, I’m a cake girl. I find the articles by Deborah not only extremely creative and entertaining, but the recipes ideas are awesome. Anxiously I look for her article. A smart move if you make her a regular. Glad you’re enjoying her stuff. We enjoy having her aboard as well! You can definitely count on more. The first time I ever heard of Coca-Cola cake was when I worked at Cracker Barrel. They only make it seasonally, and boy is that cake good! !